"In amusement recreation, mass diversion is no longer a dispensable luxury. Family fun is as necessary to modern living as a kitchen refrigerator." -- attributed to Walt Disney in the Disney Dream cruise ship presentation: "A Dream Come True. The Making of the Disney Dream." Recently, I have written a few columns about my discoveries during my cruise on the Disney Dream in January. Here are a few more that I hope will enhance someone's cruising experience. For the first time, I realized that all the entertainment is at the front of the ship and all the food is at the back. In general, the entertainment performers work four and a half months straight and then get a six-to-eight week vacation. They are housed in rooms behind the Walt Disney Theater on Deck 3. Some are behind the elaborately painted letters of the word "Dream" on the outside of the ship so they like to joke that they are "living in the dream". The rest of the crew is housed below the guest decks. There are crew lounges, a library, a coffee bar, and a regular bar, among other amenities. The crew has its own elevators and stairways. The executives on the crew get the rooms with portholes. When nearly everyone else was having fun in the morning on Castaway Cay, I noticed several of the executive crew staff eating together in Cabanas. I have both driven to the Disney Cruise Line Terminal at Port Canaveral and taken the Disney Cruise Line bus from a Walt Disney World resort and I heartily recommend the bus. It is a much more enjoyable and relaxing experience and your luggage is taken care of for you. 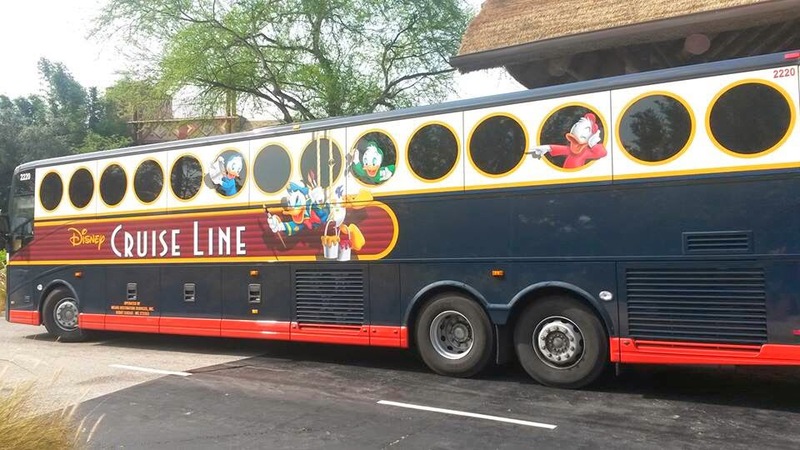 The outside of the bus currently features artwork by Disney Design Group artist Ron Cohee. 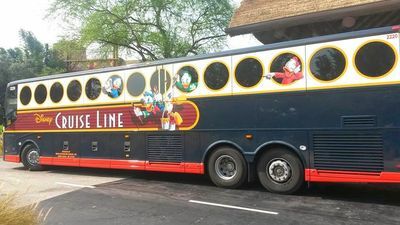 Donald and his nephews play around on the side of the Disney Cruise Line bus, based on a similar scene from the Disney Wonder ship. "I penciled the ducks—based partly on the dimensional figures on the stern of the Disney Wonder—and, when approved, inked and painted them digitally. I painted Mickey, as well, but it was a pre-existing pose," Cohee shared with me. On the stern of the Disney Wonder, Donald Duck is trying to paint the logo, while one of his nephews is cutting away with a pair of scissors at one of two ropes supporting the wooden swing Donald is on. Donald would then fall reasonably safely into the ocean with a comedic splash. "I couldn't do that same gag for the bus because then Donald would hit the pavement and that wouldn't be so funny. So I came up with a similar situation where Donald is helpless and one of the nephews is painting his tail while the other is preparing to throw a bucket of paint on him," Cohee revealed. "And if you look closely, Donald is still in jeopardy of falling because one of the ropes has started to fray, but not because of any maliciousness by the nephews." The Midship Detective Agency on the Disney Dream and the Disney Fantasy cruise ships is the latest evolution in a series of interactive games that were first available at Walt Disney World. Kim Possible World Showcase Adventure had guests using customized cellphones (Kimmunicators that were actually a Motorola i870 phone programmed for the game) to receive clues and directions around World Showcase (Mexico, Norway, China, Germany, Japan, France, and United Kingdom) at Epcot to help Kim Possible and Ron Stoppable. The beta test was held in 2006 with the final version debuting in 2009 and lasting until May 2012. In June 2012, the experience was replaced by Agent P's (the alter ego of Phineas and Ferb's pet platypus Perry) World Showcase Adventure that required guests to sign up and be issued an official FONE (Field Operative Notification Equipment) or their own smartphone to connect with Major Monogram and his intern Carl to get a series of clues. Up to four guests could join forces to stop Dr. Doofenshmirtz from wreaking havoc. There are seven different adventures (China, France, Germany, Italy, Japan, Mexico, and United Kingdom pavilions). A version using cards debuted at the Magic Kingdom in February 2012 where Merlin is recruiting apprentice sorcerers to defeat Hades and his fellow villains, Yzma, Cruella, Scar, Jafar, Maleficent, Ursula, Ratcliffe, and Dr. Facilier, who are searching for four shards to create a magic crystal. There are nine quests and the guest is given a map, a Sorcerer Key Card, five spell cards, and brief training to find the 20 magic portals scattered throughout the various lands (except Tomorrowland). Merlin appears in the final portal welcoming the guest to the rank of Master Sorcerer. The Midship Detective Agency had its soft opening on March 6, 2012, as part of the preview cruises. It opened to the general public on March 31, 2012, when the ship embarked on its maiden voyage. The attraction follows a format similar to Sorcerers of the Magic Kingdom in that a card, rather than a phone, is used. Players use cards in the form of square detective badges with a 2-D barcode on the back to activate different Enchanted Art locations in finding clues and missing items. They have a special casebook to jot down important information. The seven suspects are Jafar, Maleficent, The Evil Queen (from Snow White), Captain Hook, Dr. Facilier, Yzma, and Cruella De Vil. The Case of the Plundered Paintings: There are missing paintings and the detectives need to recover them and identify the culprit. Every play-through has a different culprit. The Case of the Missing Puppies: Roger Radcliffe and Pongo need help to find the missing 99 puppies. It's not Cruella, the most obvious suspect. Detectives find she is not even on the ship. The Case of the Stolen Show: The Muppets (20 of them) are prepared to start production for a show on the ship but the props have disappeared so Kermit the Frog goes to Mickey's Midship Detective Agency office to get help. However, inside the office is Pepe the King Prawn who is temporarily taking over while Mickey is out to lunch. (Mickey makes a voiceover cameo at the end of the game finding that someone has changed the locks to his office.) For this crime, the real suspects are Fozzie Bear, Camilla (Gonzo's chicken girlfriend), Beauregard, Bobo the Bear, Lew Zealand, and Rizzo the Rat. The Muppet footage was directed by Kirk Thatcher. In the rush to get on the job of solving the crime, guests often miss the nice touches at the two sign-in desks on Midship Deck 2 and 5 that are filled with various clippings. For future researchers (and those who put together ship scavenger hunts for their group) here is what is displayed on the two desks. Extra! Extra! Crimes at Sea! Midship Detective Agency Chief Detective Mickey Mouse reports that some really big cases have just come across his desk aboard the Disney Dream. "These are some doozy cases!" said Mickey who reports that he needs the help of new detectives right away! Founded in 2011, the Midship Detective Agency is the Disney Dreams newest addition. From the Desk of Goofy. "Dear Mickey, Gwarsh! Still working on that case of the missing sock! The dryer is my main suspect. Kind regards, Goofy." To: Mickey Mouse Midship Detective Agency. From: The ship's cruise director. "Thank you for locating my hat. Who knew I was wearing it the entire time except for you. Brilliant job! You make our ship proud. Now where are my glasses? Oh, wait, here they are." "Mickey, congratulations on catching Pete! That despicable villain stole my dress whites and tried to dye them a different color. But you caught him red handed! Now I can still go to the formal dinner tonight. I am in your debt." Pete. Wanted for: Being mean and despicable. Aliases: Peg-Leg Pete, Bad Pete, Mighty Pete, Pete the Cat. (A red stamp saying "Caught" over Pete's picture. On Deck 4 forward port (left) there is a Muppet Call Board for the supposed show the Muppets are producing just outside the Walt Disney Theater. If you choose The Case of the Stolen Show at the Midship Detective Agency, you will be directed to find this board. A Midship Detective Agency badge modified to showcase Pepe the King Prawn and identify it as his detective agency. Below is a posting with slips (some of which are missing) that states: "Come visit MY detective agency. Help me solve the case, ok?....so I can take credit." Button: "It's not easy bein' green". Poster: "This egg-citing act is definitely for the birds! 'Poultry in Motion' starring Camilla". Poster: "Rowlf plays songs in the key of Woof"
Poster: "The ABCs because 'ABC" spells 'Fun'!" The ABCs are Animal, Beaker and Chef (Swedish Chef). Poster: "See Gonzo the Great in his hottest performance ever with the amazing AquaDuck". Poster: "The Muppets Present 'Goin' Overboard'." Notice: "Costume Pick Up. 'Rhapsody in Red'. Red sequined vest, pants, bow tie." Notice: "Set Painting Duty for 'Bein' Green' set. Brushes provided with lots of green paint." On the Disney Magic and the Disney Wonder, the bronze friezes that surround the atrium area on Decks 3 and 4 have Disney characters in costumes and doing things that the ship's crew would do. On the Disney Dream and the Disney Fantasy, those bronze friezes show the characters attired in costuming and doing activities that the guests would do. Daisy Duck is relaxing and reading a book in a deck chair at Serenity Bay, the adult beach on Castaway Cay. Donald Duck has snorkel gear and an inner tube for water activity at the family beach at Castaway Cay. Chip 'n' Dale are in sunglasses holding a life preserver and inflatable raft to enjoy some water fun. Mickey Mouse and Minnie are dressed elegantly and holding hands to enjoy Palo's or Remy's upscale restaurants. Huey and Dewey with a spyglass and looking at a treasure map while Louie in a pirate captain's hat and swinging on a rope are celebrating Pirate's Night on the ship. Goofy and his son Max have golf clubs as they prepare to enjoy mini-golf on the Sports Deck 13 Aft. The railing of the staircase has images of the faces of Mickey, Minnie, Goofy, Pluto and Donald. A red crab scuttles across the Tropic of Cancer line. A jelly fish swims by in the upper left while there is a pirate ship on the right. A green sea monster appears and jumps over the Dominican Republic. A green turtle swims slowly near the bottom. A diver's helmet pops up with an eye in it. Jumping dolphins flip in and out of the water near Cuba and later the Dominican Republic. A pirate ship is in a sea battle with another ship and a cannon ball sinks that ship. A Chinese junk ship sails through the waters and a huge green fish snaps it up. A hammerhead shark swims around. A purple sea monster pops up. A colorful parrot flies through the picture. A green sea monster (whose head reminded me of Gorgo) appears and waves. On Deck 5 midship port (left) there are a series of paintings depicting different types of transportation, and I have no idea why they are there, but they are done in a stylized form befitting the art from the Golden Age of Cruising. I bet many people never see them on their entire voyage. Also on that same deck on the aft side, before going down the hallway to the Oceaneer's Club are several brass plaques with Disney ships, but no identification. I was only able to identify with any assurance Captain Hook's Jolly Roger from Peter Pan and Mickey Mouse's steamboat from Steamboat Willie (1928), but the others were teasingly familiar. I suspect one might be Captain Jack Sparrow's Black Pearl, but I will need to do further investigation or hope that a MousePlanet reader is sharper than a Disney historian. I am constantly reminding Disney fans to be observant and to look at the walls, the floor and even up to the ceiling in order to discover some wonderful attention to detail. However, I am often just as oblivious and need to follow my own advice. I can't remember the number of times I have stood in the Deck 3 lobby entrance to the Walt Disney Theater and admired the huge photo of Walt Disney, seen children interact with costumed characters, or been tempted by the nearby merchandise shops. Yet, on my last trip, I discovered something in that location that I had never seen before: The Disney Zodiac. As you admire Walt's smiling face, look up above and you will see that there is a very detailed circular piece of brass artwork where Disney characters represent the signs of the zodiac. Obviously, it was difficult to find perfect matches for each sign but whoever came up with the final choices did fairly well and certainly made me smile. The Walt Disney Theater has a 40-foot wide proscenium stage and seats 1,340 guests. Since the ship can hold up to 4,000 guests that is more than can be seated in the two shows each night. When I asked about this discrepancy in numbers, I was told that the expectation was that not every guest would go and see the shows. The Disney Magic and The Disney Wonder have a theater that seats 977 guests and have a guest capacity on the ship of 2,000, so that seems to be a little more reasonable to me. I am preparing one more column with some interesting things I discovered on the Disney Dream about the various restaurants that should be appearing soon. Except for one glitch with a stubborn crew member last year who was in love with his status, I have always had a marvelous experience on all my cruises. Jim, if by "entertainment performers" you mean the main stage performers (and characters), they are actually on 8-month contracts. They spend two months rehearsing the shows in Toronto, then six months on-board. They typically have 1-2 weeks for "crossover" where the incoming cast gets to learn from the outgoing cast. Unlike regular crew contracts, they don't get a "vacation" at the end of their contract, but except in rare cases have to audition again to get a new contract at some point in the future. Thank you for the correction! I never mind being corrected so that the accurate information is out there. The performer I talked with may have misunderstood what I asked. The same information I printed also came from a former performer who was doing one of the on board presentations. However, your information seems more accurate especially since it more closely aligns with the contracts for performers at Walt Disney World. I KNOW about those contracts since I was a "friend" of Merlin for the Sword in the Stone ceremony and also a "friend" of Prospector Pat in Fronteirland among other things. Thanks for reading!